This sixth installment in OCEG’s Anti-Corruption Illustrated Series addresses data analytics. Companies face significant economic hurdles as margins shrink and profit expectations grow. Implementing and monitoring a strong anti-corruption compliance program under these conditions can be daunting. Forensic data analytics — known as Anti-Bribery and Corruption analytics (ABC analytics) — can help companies cost effectively and efficiently use data discovery to enhance their anti-corruption efforts. 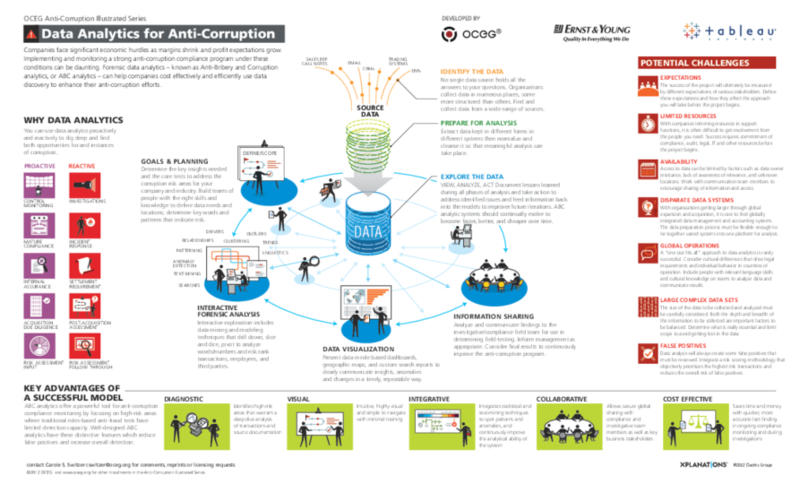 We have emailed instructions to access Illustration – Anti-Corruption Series #6 – Data Analytics For Anticorruption to . Make sure the email arrives in your inbox: either add "support@oceg.org" as a safe sender to your email platform, or if you use Gmail, drag our email into your Primary tab.